Modernizing and expanding our local and state Infrastructure. Guaranteeing ethics and equality for all. A former drama teacher, Ms. Brown, a wife, and mother of two daughters is an experienced public servant whose experiences start in 2004 when she volunteered for the Kerry and Edwards campaign. From 2004 to 2008 she worked for the Maricopa County Democratic Party as an office manager and executive assistant whose main responsibility was to recruit volunteers and assist legislative district chairs. She worked in Governor Napolitano’s and Governor Brewer’s office in the Constituent Services Department, observing how policies were formulated. Afterward, she was an assistant to former State Senator Barb McGuire and saw how bills were written. She also saw Republican heavy-handedness in burying Democratic bills and, later, constitutional amendments like the Equal Rights Amendment. She believes that a lot of our legislators are in office for “personal gain” and “are out of touch with reality with what is happening with people. They are living in a bubble and do not treat people with dignity and compassion.” This is especially problematic because it is in the local sphere of the city, school and utility boards, and state level where most decisions affecting lives are made. Elizabeth Brown on the Issues. She believes approving Invest In Ed, closing corporate tax loopholes, and raising corporate tax rates that are essential in bringing our schools to acceptable 2019/20 funding levels. She wants teachers to get large annual raises until their salaries are on par with the national average. Reducing classroom sizes to a 23 to 1 student to teacher ratio. Funding full day Pre Kindergarten and Kindergarten. Increased funding for Special Education and English Language Learners programs. Promote S.T.E.A.M., Early College, and Early Career Pathway opportunities. Funding two years free Community College like states like Arkansas, California, Delaware, Kentucky, Minnesota, Montana, Nevada, New York, Oregon, Rhode Island, and Tennessee. Lower tuition at our public universities for our in-state students including Dreamers. No expansion of Private School Vouchers. She is against Proposition 305. No state funds to go towards Koch Learning Centers at Arizona State University and the University of Arizona. Ms. Brown is very critical of how the Republicans and their shortsighted sponsors are not taking proper environmental (supply of water for example) impact concerns to heart when pursuing development projects in the state. 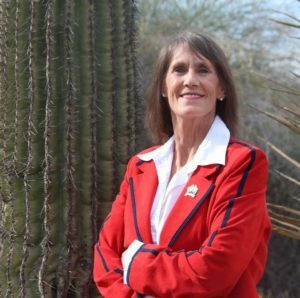 Noting that her opponent has not done anything to address the states water shortage, she openly speculates that if there is not immediate rethinking on conservation and development, Arizona “will eventually look like the Sahara Desert.” She believes it is a “sin” that developers get to dictate that properties are required to have patches of grass that require use of our precious water supply to maintain. She is in favor of water restrictions “on watering lawns or even personal use.” She supports the use of recycled or grey water in these instances as well. Before this drought becomes more widespread, “we should come together for the good of the state” and plan for the future. Like most of the other Democrats running in 2018, she strongly believes that Arizona, with an average of 296 days of uninterrupted sunlight, should be the solar capital of the United States and perhaps the world. Noting that her first home in Arizona in 1983 was furnished with solar panels, she is disappointed that the state, with its backward and fossil fuels subsidized leaning leaders in the legislature and Arizona Corporation Commission, has blocked our state becoming a leader in the solar industry. See This Obscure Agency Crushed Solar Power in Arizona. She supports the Clean Energy for a Healthy Arizona Ballot Initiative. Realizing that LD 12, especially Queen Creek and San Tan Valley are growing, Ms. Brown recognizes that the area needs new roads and expanded highways. She is in favor of improving and expanding our light rail system. She also supports the creation of a high-speed rail line that connects Tucson, Phoenix, Flagstaff, and Las Vegas. She supports public broadband and wants all families in rural and reservation areas gaining access to high-speed Internet. The war against Dark Money and Suppressing Democracy. She is aghast that Republicans do not allow Democratic-sponsored bills to be heard and dismayed when figures like Eddie Farnsworth condescendingly tell ladies to sit down when he buries consideration for the legislature to ratify the Equal Rights Amendment. She supports the Outlaw Dirty Money Initiative because people need to know who is funding candidate’s campaigns. She is proud that she is a Clean Elections Candidate. She is also against Republican attempts to suppress the vote by doing away with early voting or passing legislation to overturn city passed measures like Tempe’s attempt to do away with Dirty Money (by a 91 to 9 tally). She favors making the day for voting a national holiday or on a weekend when more people are not working. Ms. Brown believes in unions, a $15.00 an hour wage, and a vibrant fully state-funded public education and college system are key to planting the seeds to growing our state’s economy, recruiting industry, and keeping our “young people” in Arizona. She also states that we should appreciate and respect the blue collar as well as white-collar professions. Increase the number of homeless shelters that provide trade schools and job training. Provide more affordable housing. She is concerned that many young people are being priced out of housing in LD 12 because of soaring home costs. Closing corporate tax loopholes and increasing corporation tax rates so increased funding can be allocated to anti-poverty programs. Helping our returning veterans who are in traumatized and in need. She thinks Obamacare was “a good start” but she feels, with still rising medical costs, it is time for Medicare for all. She supports people being able to buy into the State Medicaid Program. She also favors greater investments in mental health. Ms. Brown wants to decriminalize marijuana and do away with the profit-centered private prisons. She also favors trade school opportunities as part of the rehabilitation program for prisoners so they have the skills to successfully apply when released. Universal Background Checks on gun sales in stores, on the Internet, individually, and at shows. Requiring gun owners to take gun safety classes. Keeping guns out of the hands of the mentally ill and domestic abusers. Increase the number of school resource officers and provide some of them with extensive firearms training. Supports ratification and, as mentioned earlier, was aghast that her current State Representative Eddie Farnsworth buried consideration and berated people in a public arena who demanded to know why he was doing so. Seeing a surge in enthusiasm since the 2016 election as evidenced by the Me Too Movement, March for Our Lives, March for Science, Red for Ed, and the opening of Democratic offices across the state, Ms. Brown and her team of committed staff and volunteers see a great opportunity this November to turn the LD 12 Senate seat blue. She is a very compelling candidate who is committed to the Progressive causes of social justice and the public good. Voters should review and consider her views and ideas when deciding who is the best candidate to move the district forward when the new Legislature convenes this January.